Pampering your entire body with the luxury of relaxation is easy with the Roma Poolside Chaise Lounge. The Roma Chaise meets everyone's needs for comfort because it offers 4 relaxing recline positions and a drop down foot section. The Roma Chaise Lounge's flexibility allows you to spend your day alternating between restful naps under the warm sun, engrossing books, and lively conversations. 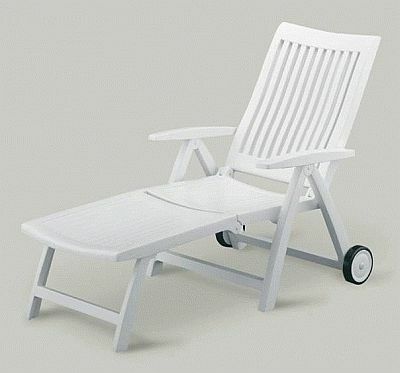 The Roma Chaise is designed with large wheels so you can easily adjust to take advantage of (or to avoid) the sun's direct rays. It is available in white only. When the weather is cold, you can still cuddle up on your Roma Chaise, if you choose. Kettler® has an exclusive, high density resin that withstands all weather conditions and is guaranteed to look fantastic for years to come. While other resin materials on the market soon suffer from cracking, fading, and yellowing, Kettler® provides superior quality, UV resistant mineral-reinforced resin furniture that remains as beautiful as the day you purchased it. What a great addition to your poolside! Dimensions - 28" W x 41.5" H - seat depth 44.5"